Having fantastic content is the most important part of a great website. However, your text needs to be presented in a way that makes it easy for people to read. If your text is hard to read, then many people will give up and leave your site. This will harm your site’s popularity and SEO performance. That being said, most online readers are actually NOT going to read your articles from start to finish. They are going to scan quickly for the answers they are looking for. In fact, research from the Nielsen Norman Group estimates that internet users only read a measly 20-28% of the words on a page. If you can make your text so incredibly easy to scan that users find their answers, then Google will see that your site provides good user satisfaction. This will make your site rank higher in search engines, leading to more traffic and revenue. For these reasons, both readability and scannability are absolutely crucial aspects of web design and content SEO. There are many tools available to help improve readability, such as the Hemingway app and the built-in tool in the free Yoast SEO plugin. But I personally prefer to just stick to the principles below. Writing is a creative process and I find readability tools to be limiting. Here are 14 actionable ways to improve the readability and scannability of your articles. It is very important to split your text into chapters using h2 and h3 subheadings. These subheadings should be worded clearly so that users can immediately understand what the chapters are about. It is also important that your chapters are well organized and listed in an order that makes sense. If an important fact about your topic needs to be explained for the rest of the article to make sense, then make sure to cover it in a chapter that’s close to the beginning. Also, make sure that the styling of your subheadings is clear and that they are discernible from regular paragraphs. They should have bigger fonts than the rest of the text and possibly even a different color. Few things on the web are as unpleasant as text with very long paragraphs. This type of text is a nightmare for people who are just looking for a quick answer to their question. In many cases, people will not even try to make sense of these massive blocks of text. They will simply leave immediately and never return to your site. For this reason, you should try to keep your paragraphs shorter, rather than longer. You don’t need to have super short paragraphs like me, but definitely don’t make them longer than they have to be. Choosing the right font for your text is one of the most important ways to improve readability and scannability. There are thousands of different fonts available on the web. Some are great for reading, but others are downright terrible. Serif fonts: A font with small lines called serifs attached to the ends of larger lines in a letter. 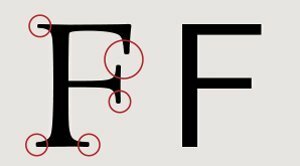 Sans-serif fonts: These are fonts that don’t have these small lines attached. You can get good results with both serif and sans-serif fonts. Google and Facebook use sans-serif fonts, while some popular text-based sites like Medium use a serif font. I personally prefer sans-serif fonts and I use the Google font Open Sans on this site. Other good fonts to consider are Arial, Helvetica, Verdana, Roboto, and Proxima Nova. Make sure to check your site on different devices, screens and browsers to make sure that your font looks good everywhere. The right font size for different uses depends on a few things. Many sites, like Google and Facebook, get away with using very small font sizes because much of the text on their sites is displayed in short bits and pieces. However, for sites where the main content is a text-based article, it is generally better to have a bigger font. 14px should be an absolute minimum, which is what Wikipedia uses. I use 17px for the main content on this site, but it drops down to 16px on smaller mobile devices. But some other content-heavy sites, like Medium, use a 21px font size with great results. It’s also important to make sure that the width of your content is appropriate for your font size. If your font size is small, your content should be relatively narrow. If you have a big font then your content should be wider. Some say that the optimal content width is about 50-60 characters of text per line, but I personally think this is too low. My site has up to 80-90 characters per line on the full-width desktop version. Here’s a free tool you can use to count characters. Try copy-pasting text from your site that fills an entire line and see how many characters it contains. Reading on a smartphone can be a terrible experience on websites that aren’t optimized for mobile. For this reason, it is absolutely crucial for sites to have a mobile-friendly design. This is easy to accomplish with responsive web design. Most modern website themes implement this automatically. Here’s a free tool from Google that can help you determine if your website is mobile-friendly or not. If you need to list items in your text, then it is much better for both readability and scannability to use lists. Ordered lists: These display a number before each list item. Unordered lists: These have a bullet as the symbol before each list item. If the order of the items matters, use ordered lists. If the order is not important then unordered lists are more appropriate. Your text and background need to contrast properly. It is best for readability to have black or dark gray text on a white background. At the same time, if parts of your website (like the menu or header) have a solid color, then you should use a font color that contrasts properly. For example, the navigation bar on this site has a solid blue color so I use white text for the menu items. It’s also important to consider the structure of your sentences. Don’t make your sentences too long. Instead, use commas and periods to break them up into smaller pieces. Also avoid constantly listing many items in your sentences, since this can be hard to read and make sense of. Bad: Writers face a ton of options when considering readability, scannability and legibility of their online text. Better: Writers have many options to improve the readability of their text. Also use transition words and phrases to link sentences together, such as “however,” “in fact,” “also,” etc. This improves the flow of the text. It is sometimes useful to style parts of your text to increase emphasis. Examples include bolding, italicizing, underlining or highlighting. Depending on your writing style, you can use this to emphasize key pieces of text that you don’t want your readers to miss. However, this should definitely be used sparingly. Too much can look spammy. When you quote another website or person in your text, then you should use the blockquote element. This generally changes the style of the text inside the blockquote tags, making it clear that it is a quote. In HTML and XHTML, the blockquote element defines “a section [within a document] that is quoted from another source”. Using obscure and complicated words may make the writer feel smart, but they aren’t really helpful for readers. If readers need to stop and decipher what words mean, then that will completely ruin the flow of the text for them. Make sure to consider your audience and use words and phrases that most people understand. In some cases, using photos and screenshots can increase the usefulness of your content. For example, they can be helpful if you are trying to explain complicated topics or showing people how to accomplish certain tasks on the computer. That being said, don’t add photos or screenshots unless they truly add value for your readers. It can be boring to read text that is written in a very formal tone. For this reason, you should try to write interesting text that keeps people engaged. It is beyond the scope of this article to go into detail about how to do this, but I recommend that you read about copywriting. The art of copywriting is mostly about sales and marketing, but studying it can also make you a much better writer overall. When I write an article, I never publish it on the same day. Instead, I save it as a draft in my WordPress editor, then open it again first thing in the morning on the following day. By then, I have gotten a good break from writing and given my brain plenty of time to process the information better. Now I go through the entire article, sentence by sentence, making improvements wherever I can see them. I may read and edit some sentences and paragraphs multiple times before I am happy with them. With this method, it takes me two days to write an article. On the first day, I do my research and write the article draft. On the second day, I go through the text carefully to make everything perfect before publishing. Using this two-day writing method has made me a much better writer.